We’re doing our first ever clothing only sale. 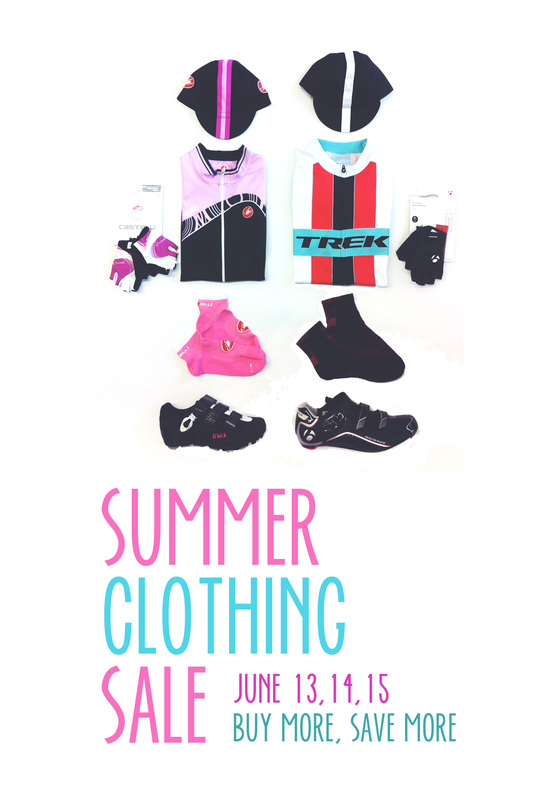 Shoes, socks, riding kit, hats, all on sale this weekend. We wanted to make sure you got a chance to try out some of the great new stuff we picked up this spring, like the Giro New Road clothing, matching Castelli kits, Terry women’s clothing and a whole slew of new shoes. We have more clothes than anyone in the county, and arguably a cooler selection than anyone in a 3 county area. For instance, where else are you gunna nab some camo wool socks, Italian shoes, merino wool polo shirts and neon yellow bibs? Here’s the details on the sale. Buy more, get a bigger savings. Easy. Spend between $50 and $100, get 10% off. 100-150: get 15% off. 150-200: 20% off, 200+ 25% off. That’s easy. That’s really just a pair of shorts and some new shoes. All 2014 stuff, this isn’t old stock! 3 days only. The sale ends of Sunday at 5. If you miss it, you missed it.